How Much Can You Make in a Special Education Career? What Courses Can be Taken for an Online Special Education Degree? Throughout the U.S., special education teachers instruct students who live with physical and mental disabilities. Their expertise ensures students have the opportunity to learn to the best of their abilities. While earning an online bachelor’s degree in special education, you learn and apply educational best practices. Finding work after graduation should pose little difficulty since the Bureau of Labor Statistics (BLS) projects that demand for special education teachers will grow 8% from 2016-2026. 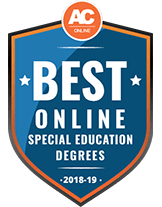 Earning an online special education degree has many advantages over on-campus programs, especially for prospective students who work full time or raise families. These programs offer tremendous flexibility and can still place you at a local school for your student teaching experience. In this article, you can discover more about learning online, degree curricula, special education careers, and financial aid options. The following list includes the best online bachelor’s degree in special education programs in the U.S. In compiling this list, researchers examined tuition, online course offerings, graduation rates, and job placement (within one year of graduation). Although the school you eventually attend may not appear here, starting your search with these schools teaches you the positive qualities to look for in potential programs. Established in 1971, Liberty University is a private, non-profit institution with an online bachelor's degree in special education interdisciplinary studies. Most full-time distance learners complete this degree in 4 years after completing 120 fully online credit hours. Graduates may pursue positions in either elementary or secondary schools, working with students affected by mental or physical disabilities. Transfer students may transfer up to 75% of their degree requirements to Liberty, as long as the credits satisfy general education requirements or are directly relevant to the major curriculum. Minot State University offers a human services bachelor's degree program in intellectual and developmental disabilities. As a partner with the United States Developmental Disabilities Division of the Department of Human Services, Minot State produces human service professionals capable of handling careers in leadership, program planning and service coordination for children and adults. To graduate, students must earn a "C"average or higher on all required courses, complete an externship, and submit a formal application for graduation at the end of the program. This 143-credit program is accredited by the National Alliance of Direct Support Professionals and takes about 4 years to complete. 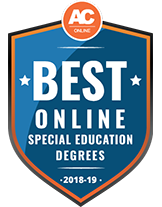 At the University of Wisconsin-Stout, the online special education bachelor's degree program can be completed in a hybrid format or entirely online. Full-time students can finish the degree in 4 years, and should be prepared to teach students aged 5 through 21. You can also complete a post-baccalaureate certification or autism specialty certificate. Graduates are eligible to receive a Wisconsin teaching license in cross-categorical special education upon completion of a 3-part benchmark teaching sequence at the end of the program. Most incoming transfer students may apply previously earned credits toward their bachelor's degree if they were earned at an accredited institution and meet core or major requirements. Chaminade University of Honolulu offers an elementary education program that can be completed entirely online. Each semester is 15 weeks in duration, and, for most full-time students, this 120-credit degree takes 4 years to complete, which may include taking summer courses. You must maintain at least a 2.0 cumulative GPA on all coursework and participate in Chaminade's service learning, observation and participation program. Per guidelines set by the Hawaii Teacher Standards Board, upon completion of the program, graduates are licensed to teach kindergarten through 6th grade; qualifications translate to most other states, as well. The online elementary education/special education bachelor's degree at Dakota State University prepares its graduates to teach students with autism and behavior, cognitive and learning disabilities in K-12 learning environments. Full-time students usually complete this degree in 10 semesters, including a yearlong residency of supervised student teaching. This field experience takes place in public schools and serves as the capstone course. After graduation, DSU distance learners often go on to earn teaching certifications in their respective states. Prospective students who already have 24 or more college credits may be able to earn credit toward this special education degree if their GPA is 2.0 or higher. Fontbonne University's Special Education program, Paraprofessional Pathways, is an accredited online BS degree for those who are paraprofessionals or a teacher's assistant and want to learn while they work. Students may learn faster with summer classes in addition to the traditional semester schedule. Graduates will receive certification in K-12 mild/moderate cross-categorical upon completion of this program. Student teaching and field work may be completed at the student's local school, depending on their school district's policy. Chadron State College offers special education degrees in 2 categories: endorsement in K-12 and Early Childhood Inclusive endorsement for birth through grade 3, depending on a students specific interests. The program is available online, with some required classes to be completed in-person. This program covers a large scope to prepare students for whatever teaching environment they choose to pursue post-graduation, including recognition of learning differences, implementation of developmentally appropriate learning, instructional strategies and leadership. At the University of Southern Mississippi, students working towards a BS degree in Special Education can complete coursework online and take advantage of the lower, resident student rate. Many students may be eligible for the TEACH grant or financial aide, and all students will be qualified to teach Special Education in K-12 classrooms after completing this program. After completing the required class credits and student teaching requirements at their current, local school, students will be able to pursue their passion to teach special education either as a teacher, resource teacher or inclusion facilitator. Students who want to pursue a career in special education can do so at the University of West Florida. The B.A. in Exceptional Student and Elementary Education Program is fully accredited, available online and prepares students for a Professional Florida Educator's Certificate in either Exceptional Student Learning or Elementary Education. Students outside of Florida who graduate from this program will need to have their home state educator's license processed as out-of-state. In addition to online coursework, students must complete 2 100-hour field experiences in K-12 classrooms before they begin student teaching. The program will help them gain experience in classroom organization, instruction and teaching ESOL students. The Bachelors of Arts in Special Education program at Western Governors University prepares students for a career in Special Education of K-12, for children with mild to moderate learning needs. Graduates will be able to pursue a career in self-contained classrooms, resource rooms and inclusionary K-12 classrooms. Along with online coursework, students will get in-classroom experience through a Demonstration Teaching component. Students can move through courses at their own pace, and 71% of graduates finish in 4 years or less. Learners also pay per 6-month term rather than per credit, allowing them to control how quickly they finish their degree and how much they pay overall. After earning a special education bachelor’s degree online, graduates typically begin their careers as special education teachers. After gaining experience, teachers branch off into different roles within the field. As a result, these professionals often possess different job titles and earn different salaries. Like many fields, higher salaries come with experience, especially at public schools that use salary schedules. Consider your online special education bachelor’s degree as a foundation on which you can build a unique career path suited to your interests, skills, and professional goals. The five following careers represent a few that graduates perform either directly after graduation or after gaining experience. Special education teachers work in public and private schools at all grade levels. Typical job duties include working one-on-one with students with disabilities, maintaining students’ Individualized Education Plans (IEPs), and updating parents on their children’s’ progress. Special education teachers often work in general education classrooms, helping their students with assignments and modeling positive behavioral and academic skills. Childcare workers take care of young children either at a childcare center or as self-employed contractors running businesses from their own homes. Duties include cleaning and feeding infants and developing curricula to teach toddlers basic academic skills. A bachelor’s degree in special education prepares graduates to identify the first signs of autism and other learning disorders that appear in early childhood. Occupational therapists help people with disabilities learn new skills and adapt to new challenges such as working at a job or living independently. Occupational therapists with an online special education degree assist young adults with disabilities to identify potential careers. Occupational therapists stay with same clients for months, sometimes years, regularly visiting them at work and keeping files on their progress. At governmental and private social service agencies, social workers connect clients with resources that improve their lives. They visit clients at their homes or work to identify issues and propose solutions. As many people who need social workers have a disability, an online special education degree gives graduates the background knowledge on how disabilities impact people’s lives. Also known as instructional aides, teacher assistants perform tasks to encourage student learning, especially in large classrooms where multiple students may need assistance at the same time. Job duties include working with students one-on-one, preparing materials, and supervising students’ work and behavior. An online bachelor’s degree in special education conveys many essential skills teacher assistants need to work with students in their care. In the list below, you can explore salary and job growth data for special education teachers throughout the country. At first glance, you might notice that the figures vary widely among states. Many factors influence salary and growth such as demand, cost of living, experience level, and retirement rates. As of the writing of this article, West Virginia, New Jersey, and Vermont have the highest concentrations of special education teachers in the U.S. The New York City metropolitan area boasts nearly 15,000 special education teachers, while Connecticut, Alaska, and California offer the highest salaries in the U.S.
A typical online special education degree requires students to complete approximately 40-50 semester hours of coursework related to their major. These courses include introductory lessons common to all special education programs and specialized courses you take as part of a concentration or minor. The courses in the table below represent both introductory and specialized courses. If, when researching programs, you have questions about a specific course, contact that college or university to learn more. State and federal legislation dictates special education teachers’ responsibilities. In this course, students analyze the latest changes to relevant laws and learn how to implement them on the job. Many students with disabilities experience behavioral issues. All special education teachers much know how to respond to negative behaviors with appropriate discipline methods, modeling correct behavior, and rewarding progress. In this course, students learn the latest best practices associated with educating children with disabilities in the general education classroom. Course topics include coordinating with classroom teachers to provide all students with the best educational experience. All special education teachers must understand how general education teachers instruct students. In this course, students learn how to teach language arts skills to young children. Most programs also require that students take similar courses in English and math. In class, students practice writing IEPs based on hypothetical students’ disabilities and academic history. Another crucial part of the course involves learning how to instruct general education teachers on implementing IEPs in the classroom. Choosing the best online special education program begins with asking yourself a series of questions. The answer to each question narrows your list of potential programs until you have three to five schools to which to apply. As you review the questions below, begin developing your own criteria concerning a program’s accreditation, degree paths, concentrations, and tuition. After all, the issues that matter most to you may not apply to other prospective students considering a bachelor’s in special education. How will I participate in student teaching during my online bachelor’s degree in special education? From the moment you begin your program, college faculty and advisers contact local schools that accept student teachers. Once they find a suitable placement, the school contacts you to confirm important details such as duration and your mentor teacher’s contact information. After that, you complete an FBI background check and TB test; your state may have other requirements that all student teachers must fulfill before working with children. How do I know if this degree matches my professional goals? By reading this article, you show an interest in working one-on-one with students with disabilities and their families. Many teachers who earn this degree spend their entire careers as special education teachers. However, some use their degrees and experience as a springboard to related careers: curriculum developer, administrator, or special education advocate. Before committing to a bachelor’s in special education, research how professionals in the field use their degrees in your area. Should I disregard programs that lack concentrations? Online special education degrees typically offer fewer concentrations at the bachelor’s level compared to master’s and doctoral programs. As a result, many programs, some of them excellent, do not offer concentrations. However, if your career goals involve a particular concentration, such as autism or visual impairment, you might want to only consider programs that have the concentration you need. What is something I should look for when researching a program’s faculty? The quality of a program’s faculty directly affects your educational experience. As a result, you want to ensure that the faculty possesses extensive special education teaching experience at all grade levels. At the best programs, professors should also hold advanced degrees; you can research professors’ academic history to determine if their academic specialties match your professional goals. You can also contact professors directly to learn more about their backgrounds and the courses they teach. What is something that my program absolutely must include? You must earn an online special education degree that confers a teaching license in your home state. A license allows you to work in public schools, which employ the majority of recent special education graduates. Without a license, you have very few employment options. For this reason, you may want to disregard programs that do not offer a licensure track. You have many options when it comes to financing your online special education degree. However, too many students fall into the student loan trap by taking out high-interest or unsubsidized loans that require years, sometimes decades, to pay back. To avoid student loan regret, focus your financial aid search on scholarships and grants aimed at undergraduates studying special education. The five scholarships below represent a few for which you can apply before or during your program. Before applying for a scholarship, closely analyze its requirements and due dates. The AAHD Frederick J. Krause Scholarship on Health and Disability awards $1,000 to undergraduate students who have a disability and plan to work with children with disabilities. All applicants must study full time and apply during their sophomore or junior year. The scholarship committee prefers applicants who volunteer in their communities. To apply, submit a two-page personal statement, two letters of recommendation, transcripts, and official documentation concerning your disability. This scholarship awards $1,750-$2,500 to ASL Honor Society student members studying for careers in deaf education. High school seniors who plan to attend a college or university that hosts an ASL Honor Society chapter may also apply. To apply, submit essays, transcripts, and two letters of recommendation. Applicants who have experience volunteering with the deaf community have a higher chance of receiving the scholarship than applicants who do not possess this experience. The scholarship does not renew. The Bright Futures Scholarship assists undergraduates studying to work with children eight and under. The scholarship award varies each year, and in 2017, Bright Futures presented 19 scholarships to students throughout the U.S. College students and high school seniors may apply and can use the scholarship to pay for tuition or associated costs such as textbooks or housing. To apply, submit transcripts, essays, and letters of recommendation. Students who previously interned with Bright Horizons have the highest chance of earning this scholarship. Each year, the Order of Alhambra, a Catholic fraternal organization, awards a scholarship to one or more junior or senior undergraduate students majoring in special education or a related field. The two-page application asks students to submit a statement of purpose and an official letter from applicants’ colleges confirming their enrollment and major. Students who receive the scholarship may apply for it again the following year; no student may receive the scholarship more than twice. Undergraduate upperclassmen majoring in a mental health-related subject, such as a special education with a concentration in autism, may apply for this $1,000-$2,000 scholarship. The scholarship committee only considers’ applicants academic merit when making award decisions; all applicants must possess a minimum 3.0 undergraduate GPA. In addition to funding, scholarship recipients attend Quell Foundation events. The scholarship does not renew, and scholarship recipients cannot apply a second time.